A “Game of Thrones” actor has shared a video of him giving an iconic speech from the books about a fan-favourite character. The speech was cut from the HBO show — and the character apparently has too. Icelandic actor Jóhannes Haukur played Lem Lemoncloak on the last two episodes of “Game of Thrones.” Lemoncloak is a member of the Brotherhood Without Banners — the vigilante group that’s camped out in the Riverlands and worships the Lord of Light. 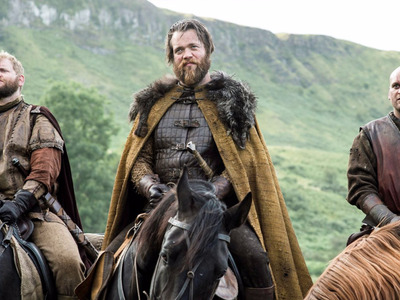 Lemoncloak and his crew were bad apples, however, and killed the peaceful group that the Hound had been staying with in last week’s episode. (The Hound got his revenge last night). In the books, however, the Brotherhood Without Banners takes a dark turn for a different reason: Lady Stoneheart — the resurrected, somewhat decaying corpse of Catelyn Stark. The character hasn’t appeared in the show, and probably won’t at this point, but Lemoncloak is associated with her in the books. Lemoncloak gives the speech in a “Feast For Crows” when Brienne of Tarth and Pod cross paths with the Brotherhood Without Banners, a plot that’s not happening in the show. The Brotherhood has captured Brienne, Pod, and another night who has allied with House Lannister, Ser Hyle Hunt. Lady Stoneheart wants them all hanged. As seen in the video, Lemoncloak acts as the interpreter for Lady Stoneheart, whose throat was cut when Catelyn Strk was killed at the Red Wedding. “She don’t speak. You bloody bastards cut her throat too deep for that. But she remembers. What do you say, milady? Was he one of them?” he asks. Brienne yells out a word to stop the hangings for the time being, and that’s pretty much were the books leave off. For now, though, enjoy Haukur’s speech, since it seems increasingly likely that it’s all the Lady Stoneheart action that we’re ever going to get on the show.